My Silicon Valley friends who aren’t in the high-tech industry find my fascination with technology endearing. This was especially true the other day when we went to the newly opened Pour Tap Room, which was bolstered by promising reviews. Nestled in downtown Santa Cruz, the Pour Tap Room uses wearable technology in a very non-traditional environment. I’ve used all kinds of payment technologies in bars and restaurants, but never a wearable to securely access and track purchases of my beer. And so some of my friends decided to humor me and go along to do some research. As soon as we entered the bar, we provided our drivers’ licenses and credit cards to the staff. In return, the staff gave each of us a wearable – a programmed plastic wristband and a beer glass. I was fairly certain there was no secure element protecting my credit information in the wearable. The staff eased my concerns, confirming that my credit information was not transferred to the wearable. Instead, it was kept on the computer like an open tab. 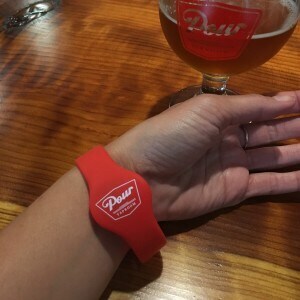 Wearing the band, I could tap and pour from more than 50 different beers ranging from sour to wheat to IPA. The wearable also measured how much I poured. After we had had our fill of beer, we stood in a long checkout line – a drawback because no one should ever have to wait too long to pay. But the process was quite simple. I just handed my wearable to the staff, they touched it to the reader and then told me what I owed. If I wanted to put the charge on my card that was taken when I arrived, which I did, and I was on my way. Companies innovating with technologies like RFID are building completely new consumer experiences. Naturally, if there was a way to work mobile payment using a secure element into the overall experience, the wait in line to pay would not have existed. Until then, I’ll be patient and enjoy the very custom beer drinking experience, which was enhanced using a proven technology in a new use case. 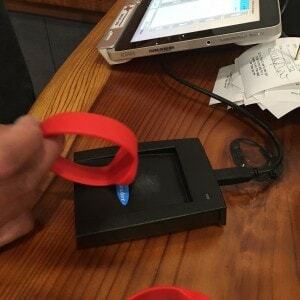 After our experience at Pour, I couldn’t help but be excited about the endless possibilities of RFID technology, which my company and others in the industry develop. RFID continues working its way into our daily life and making convenient, personalized and enhanced experiences. What’s next? I get a smile about where I need to go to “research” next. Great story. Can rfid be on the luggage. Chaos at airports at baggage claim where passengers looking for the luggage and at times walking away with wrong suitcase ( as lots of bags look similar) will be eased with rfid tag on the bag and receiver on smartphone or wearable. It would be great if a spa or pool had bands like these so you don’t have to have a wallet or phone in or around the water. It would have to be a strong encryption because I’m pretty sure you don’t want everyone reading your data…. RFID i think is a boon for such purposes. One more application what i can think of is in packaging and parcel industries. Would prove very efficient for logistics purposes.